Emily Rogers is ready for a summer that doesn't involve being cast away on islands or being chased around the globe. So when she's invited to an elite pre-college class along with her boyfriend, she jumps at the chance. But things are not all they seem at the Yin Program. Students are disappearing, and someone seems to be toying with their minds... Meanwhile, on the other side of the world, Charsia O'Dell is anticipating a summer of romance and adventure with her crime-fighting partner. But she never expects that they'll be kidnapped and taken to an underground bunker to be guinea pigs to a mad scientist named Jin Yin. Most shocking of all, she learns that they are not the only super humans in the world... Somehow, Emily and Charisa have to break out of the prisons imposed upon them to decipher the conspiracy before their minds are enslaved by the darkness within... Including artwork from @LittleZari, @xlilylunapandax, @articlight, @marvelandhpcommunity/@watsoninwakanda, @EtherealCommunity/XxEthereal_AngelxX, @CannibalisticNecro, @queen_of_sass and @Kashvi/Earnesty Graphics shop. Cover sticker by @queen_of_sass for The Recognition Awards. Edited by @volatxlebxtch. Awards: Action second place in the Recognition Awards 2018. 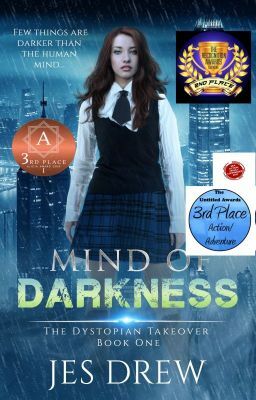 Second place in the Unknown Author in the Blue Rose Awards. Action third place in the Untitled Awards. Action third place in the Alicia Awards. Honorable Mention in the Chaos Awards. Was a Top Nominee in the Spine Chilling Category of The Victory Awards 2018. Won the Highly Commended position in the Summer Awards for the action category. Top Rankings: #1 in New Series; #3 in Team up; #12 in romantic suspense.